I've been given the job (possibly) of making some dragon head tent posts, the sort that would have been used by the Norsemen. I'm not a history buff, I only have a deeper than passive interest so have no source of reference to gauge from. And so I wonder if any of you know any good links or whatever that I might get designs. The guy who has asked for these is limited on length due to his van. But this shouldn't stop the other aspects, thickness, width and type of timber. I did read somewhere that some where made of ash. I want to make these as accurate as possible. Some good, and relatively easily available ideas can be had from the original 'Prince Valiant' film. This was made just after the Godstagt ship burial report was published. Ignore the horns and the furry knickers (not to mention the furry everything else) but the tents used in the camp scene were based on the originals from the ship burial. 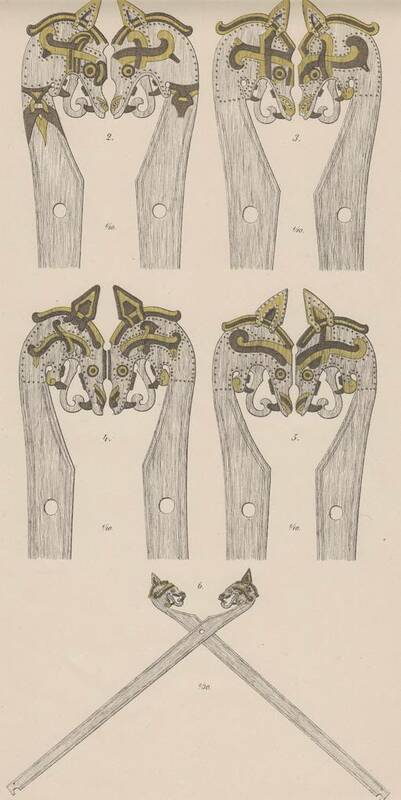 Many of the 'coffee table' books on the Vikings also have illustrations of the style too. Ash would be the wood of choice but limited budgets mean that most people resort to pine (easier to get hold of too) and whilst a nice undyed wool cover would be ace, cost again means most go for cotton / linen canvas. The canvas or whatever is not my part. But I think, when the guy gets round to it, he will have to measure the material he has to determine the woodwork side of stuff. No, mine is purely to construct the timber posts and carve the heads. I will do a websearch on those suggestions shortly. The timber section sounds good, if indeed I can get hold of twelve inch gear. Neil, are you the guy who was at Whitby last weekend? Hi Si, sorry for the delay. It looks like the limiting factor for these posts is going to be the length I can fit in the Van. That seems to be no more than 10' 6". There are also some pictures of the construction of the Oseberg tent frames here which we could adapt to suit the Gokstad Heads. I have a larger image of this last one but it won't fit here. As discussed at Whitby, we can adapt the design to avoid weak points where you think it would be best. These things will be loaded in and out of vans and storage quite regularly so need to be robust. I think Dave's thoughts about Ash are good if it's available. I have linen canvas in store but haven't decided about the final material yet. the weight of the linen I have is monstrous and that's before proofing. Looks like each head is unique. No two quite alike. Is this how you want them? Not necessarily. I think we could take what you think are the best features from each and produce a hybrid. If we are adapting the design to avoid weak points anyway, we do not have to be 100% faithful to the originals. For example, it might be stronger if we let the tongue touch the neck for another point of contact. I'm willing to be guided by your expertise and experience. This is great... All I need now are sections. Thickness, width at the widest point, the head and length. Once I have those, I'll ask my boss to price up the timber, ash, I'll get back to you on that and you can say yay or nay. I've just read through the report and it doesn't give a thickness anywhere so I guess we can run with whatever thickness is easiest to source. It needs to be strong enough for the job of course but not too heavy. Again I would defer to your experience on that one. As for widest part of the head, I guess we have to see what is available. The crossing point and the foot of the poles need to be wide enough to still be strong with a hole big enough to take the spars. 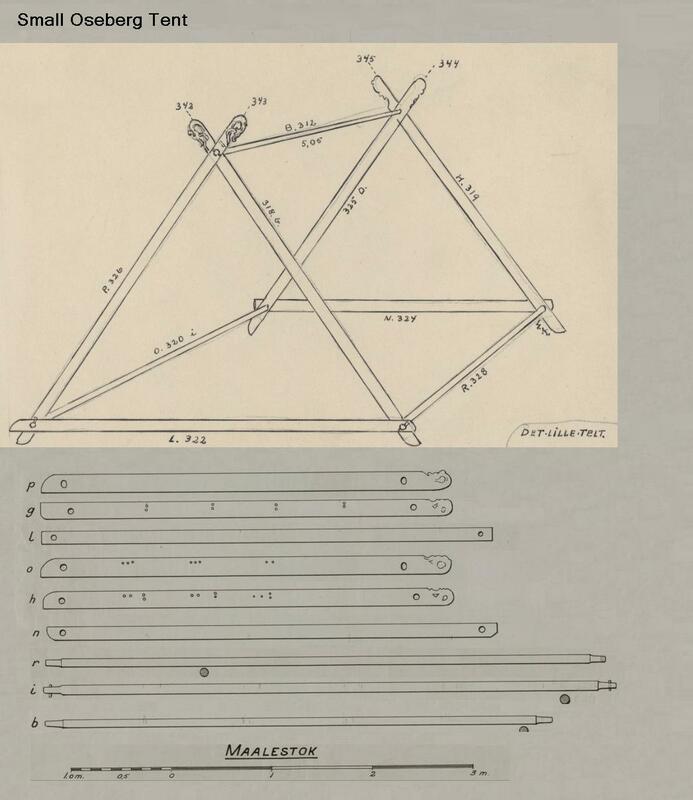 I'm guessing 2x2" chamfered to an octagonal section would do for the spars, 10'6" long again, with just the ends rounded to go through the holes. I can sort out some nice wrought iron pins to hold them in place. Would an inch and a half be enough for the rounded section do you think? 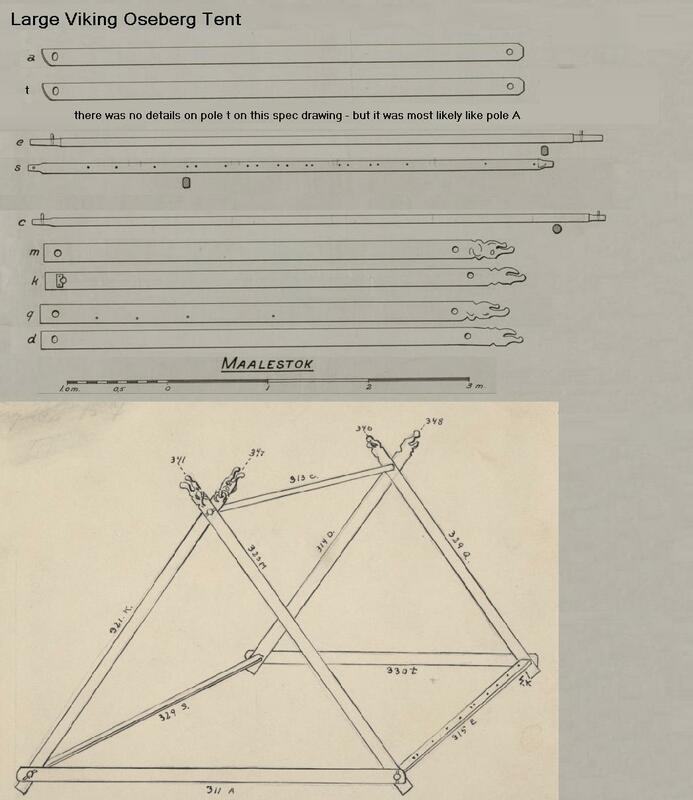 If the total length of the posts is limited to 10'6", the ratio of the original poles is 5:17 head:tent side so that would give about 9' for the tent sides and 18" for the carved heads if that makes sense. 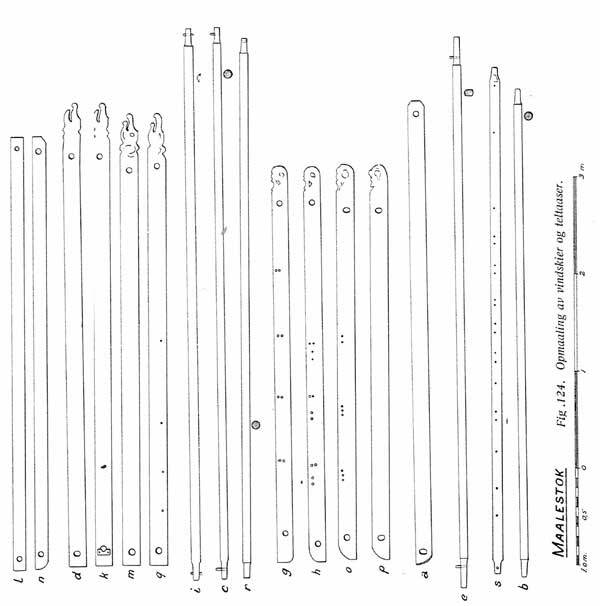 The original head section ratio is 3:8 width to length beyond the hole which would only give us 7" wide on the heads, just half that on the section with the hole, which sounds a bit skinny. I suspect we would want to beef that up a bit. If you drop me a message with your phone number I could give you a ring to discuss it more if you like. I reckon the dragon head stuff will need to be bought in at 1 1/2" so it will dress down to 1 1/4"... Thinner might be too thin? Does anyone think they might have used leather as a tent covering? I think I've read somewhere that the Norse used leather sleeping bags and presumably they had plenty of leather. Would felt be a possibility? I know the Mongolians use it for summer yurts. There was felt found under the saddle of the Lakenheath warrior but this might be unintentionally felted by the horses sweat and the friction of the saddle. Still, felt making isn't exactly rocket science. I know of Roman leather tents but nothing as late as the Viking period. I would suggest woven wool that is subsequently felted, rather than 'traditional' felt might have been used. Summer in Mongolia tends to be somewhat drier than the Northern European 'summer' and felt gets very heavy and fragile when wet. Waterproofing felt is a possibility but, again, I feel that waterproofing a woven then felt fabric is likely to be easier and less costly (in terms of materials) than 'traditional' felt. No references to back this up, this is just my gut feeling.